It was twenty years ago today. Well, if I could be bothered to work it out it'd be twenty years and some days but who's counting. Besides, Lennon wrote better opening lines than I ever will (how does that one from Across the Universe go again?). Getting back to the point, it was twenty years ago, in a brief interlude between finals and vivas, that I first went multi day backpacking with my old pal Iain. Iain's the bloke looking small against a backdrop of Great Gable above (well the finest hill to fall short of 900m is just over 570 times taller than him!). 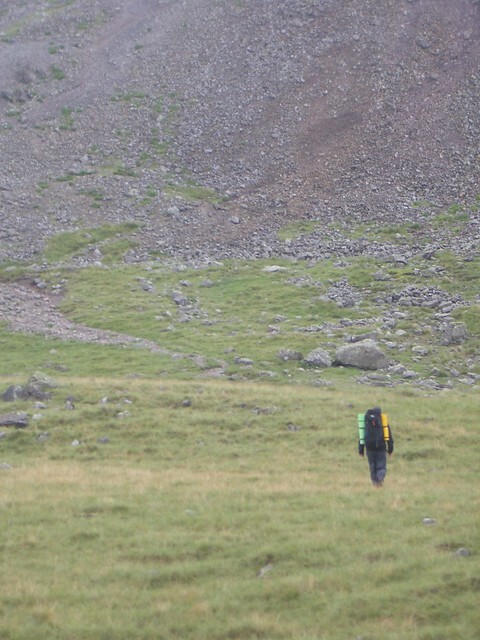 That first trip was in the Cairngorms and was my first trip without a "proper shelter". I average one trip in ten years with Iain. Sunspot activity, as it turns out, can be used to predict, with reasonable accuracy, which summers will see me on the hill with him. This month we plan to do a route I've long wanted to do: a traverse of the Grey Corries with the Ben via the CMD Arrette tagged on the end for good measure. The plan, is to cram all of that hill into just two full hill days. The plan is to cover all that hill on forty something year old, desk-bound legs. Oh, and did I mention we'll be doing it without a "proper shelter" to? I sense that It's a good thing that my attitude towards plans has always been flexible.